Seth MacFarlane, the creator of the cartoon series Family Guy announced that it’s in his plans to release a new movie of the popular funny family, The Flinstones. Kevin Reilly, who is the Fox President of Entertainment, backed MacFarlane’s declaration, stating that it’s official – the Flinstones are back! The questions you all have are “What’s going to be different in the new Flinstones version? Is it going to be 3D? Will they have new haircuts? Will they be older? What will the story be? What’s the animal version of an iPad?” Well, let’s take it one at a time. Although Seth MacFarlane wasn’t present, the media got all the answers from Reilly and from a pre-taped clip where MacFarlane gives some details. First of all, it is an animated version, as you may have guessed, and not a movie with actors. This time, the Hollywood stars will stay behind the stars of Bedrock. Regarding the 3D version, nobody said anything about it, but we think they are going to keep it nice and clean: the 2D version. 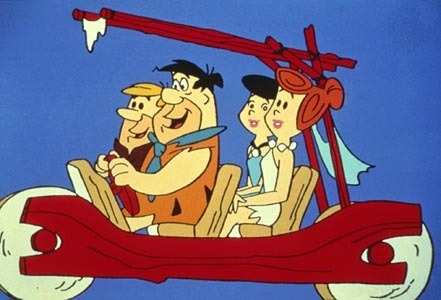 The Flinstones, The Rubbles and all their friends will keep their original look that they first got from Hanna-Barbera. “It will look the same. The only thing that will change are the stories we tell” said MacFarlane in the pre-taped clip. As for the animal version of an iPad, “That’s something we’ll have to figure out.” he said. The adorable Flinstones were a common family of three, living in a place “right out of history”. Fred is the typical husband that works from 9 to 5, that is sometimes frustrated that his masculinity isn’t quite respected – he yells at people, tries to command, gets grumpy – and other times he is just so sweet – when he kisses his wife of hugs his daughter. He has this great talent of getting himself into trouble an sometimes Wilma, his wife, seems that she has 2 children and not one. She is smart, beautiful and realistic. Their daughter Pebbles, is a toddler, a cute redhead who seems smarter than both her parents. Fred’s best friend is Barney. He is a shorty and he’s not that good looking, but he doesn’t seem to care. Fred always drags him in all the problems he causes and Barney is generally the one that has to do the “dirty work”. His wife, Betty, is best friends with Wilma and, although she is sweeter and more naïve that her, she is still able to get Barney on the right track again. They have an adopted son, Bam Bam, who is also a toddler, is Pebbles best friend and actually all he does is to smash everything in his way with a bat. Now, that you remember better the characters, what do you think the story would be about? What would you like to see in The Flinstones 2013 movie?